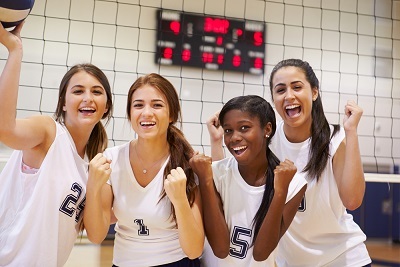 Volleyball rules high school quiz... How well do you know the high school volleyball rules? See how well you know the rules by answering the following true and false questions. Effective 2010-11, the ball shall be made of 12 or more panels that may be solid white or a color combination of a maximum three colors, of which 1/3 must be white, with each panel being a solid color. Hair devices made of soft material or unadorned bobby pins, no longer than 2 inches, may be work to control the hair. The official libero tracker may sit on the team bench rather than the scorer's table. The libero tracker shall record all substitutions for both teams unless one team isn't playing with a libero in one set. A player my contact the ball below the waist if it does not involve prolonged contact. An illegal libero replacement for Team S takes place prior to the whistle/signal of the referee. The second referee rules it illegal alignment and awards Team R a point and the ball. The libero may serve anytime he/she is in the RB position. A back-row player on or in front of the attack line cannot contact the ball completely above the height of the net and complete an attack. Two hits remain after an front-row player, in an attempt to block, contacts the ball with his/her hands which are completely below the top of the net. A point is awarded to the opponent when a libero, while positioned behind the attack line, completes an attack on the ball that is entirely above the height of the net. It is a line violation when a player steps over the sideline, outside the court, during play and there is no interference with an opponent. An unnecessary delay is called when a libero, not designated on the lineup sheet, replaces a player prior to the whistle/signal for serve. It is the correct procedure for the first referee to issue yellow and red cards resulting in a disqualification to a player directing flagrant and abusive language towards the line judge. During a live ball, the second referee shall move quickly to the side of the net opposite the ball. The libero may serve in one position in the service order. No later than 2 minutes prior too the end of the timed warm-up, a coach from each team shall submit to the scorer, the accurate written lineup of the uniform numbers of the six starting players in the proper serving order and the libero, if used. During play, the head coach may stand in the libero replacement zone, no closer than 6 feet form the sideline, to coach his/her players. A coach may substitute prior to the start of the set. When attempting to play an errant pass, a player collides with a line judge who is attempting to get out of the way. R1 awards a replay. In the event the head coach receives a red card, the assistant coach may stand to coach during play. This is a new rule for 2009-10. Bobby pins no longer than 2 inches may be worn. The libero tracker needs to be seated at the officials table near the official scorer. This is a new rule in high school volleyball. The ball may be contacted with any part of the body. The player must serve before called out of rotation. The libero may only serve in one position in the service order. To be a blocker, the player needs to be near the net, reaching higher than the net and have some part of the body above the net at the time of contact. It is illegal for the libero to complete an attack on the ball that is entirely above the height of the net. The libero must be designated on the line up sheet. This is a new rule for 2009-10. The coach may stand during play.